Made by Unknown (person) in Australia, Oceania, 1880-1923. Aboriginal people who live in the Brewarrina region of NSW are custodians of an intricate series of stone fish traps across the Barwon River. The traps form a complex net of linked weirs and ponds along 500 metres of the river. They operate at varying water heights and can be altered to suit seasonal changes. People use their expert knowledge of fish species and the environment to maximise their catch. A silver gelatin dry plate glass negative in landscape format. A silver gelatin dry plate glass negative in landscape format. 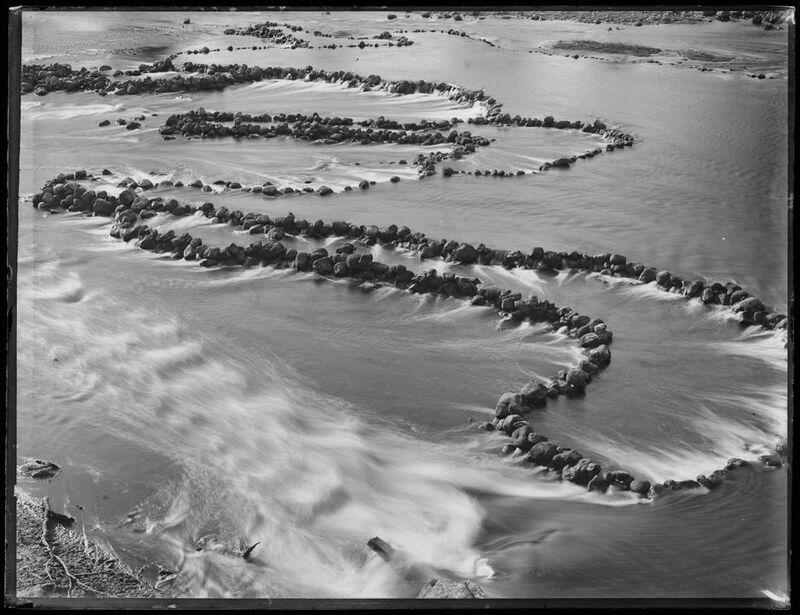 The image shows fish traps in a section of the Darling River. The fish traps consist of low stone walls constructed on the river bed. The walls are arranged to form cul de sacs that trap the fish. The Tyrrell Collection Inventory records the above caption but does not attribute the negative to a studio. This glass plate negative is part of the Tyrrell Collection and is not attributed to a studio. This glass plate negative is part of the Tyrrell Collection, acquired by James Robert Tyrrell for Tyrrell's Bookshop in the early 1930s. The Tyrrell collection was acquired by Australian Consolidated Press in 1980.